I’ve not blogged about knitting in awhile. I’ve not been knitting a ton since we moved, but I have been working on my Regrowth Shawl. Holy mackerel, it’s growing. I am approaching the last two charts, one of which is the edging chart. I am starting to see the light at the end of the tunnel. I’m not completely sure though that I am going to have enough yarn either, but I can order some more if need be. At this point, each row takes me almost an hour to knit. It’s getting pretty enormous. I finished my baby sweaters before we left home. The Little Ancolie was the one I had so much trouble with, but I did learn a ton from knitting it. I ended up making short i-cords for the button loops, and I liked that a lot. After I finished this one and declared it a “semi-disaster”, I had to make another one for my sister-in-law’s friend’s daughter. I found another pattern that I liked called “Granny’s Favourite”. I knit it with a more practical washable yarn too. It’s a cotton/acrylic blend from Kraemer. 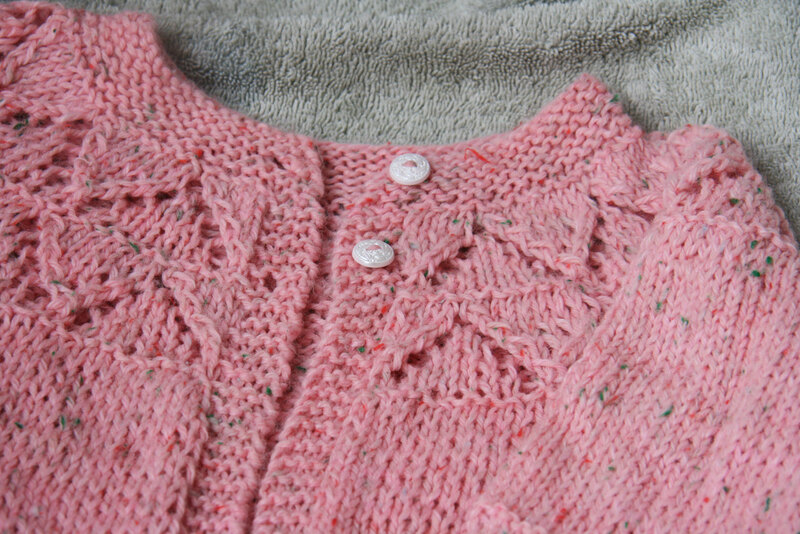 The little lace pattern at the top and on the sleeves was easy to follow. 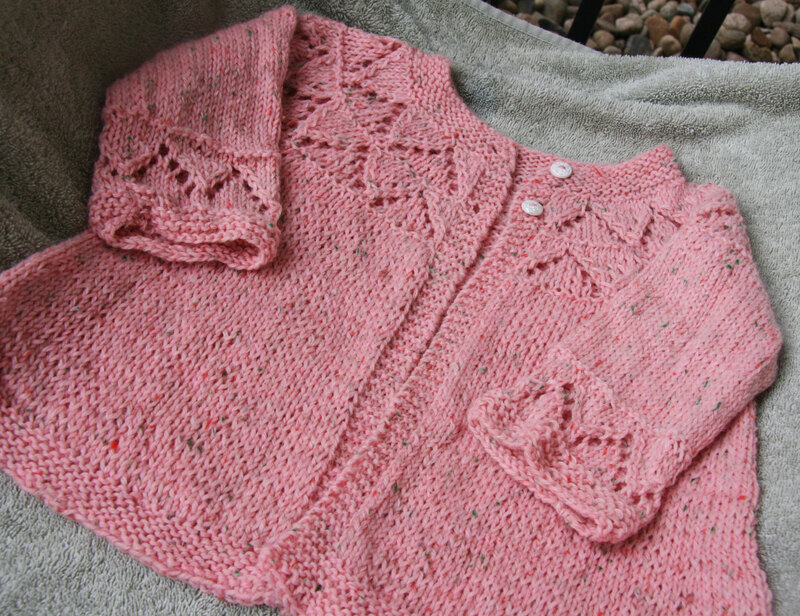 Everything about this pattern went as smoothly as the other sweater went unsmoothly. My only problem with this sweater was that I first knit a long sleeve. There is lace at the wrist, and I thought it looked too bulky and long for a sweater for an 18 month to 2 year old. So I ripped it back and made a 3/4 length sleeve. I liked this much better. I took pictures of this while it was still on the towel I used for blocking. I meant to get some better ones, but my brain was in pre-move addled mode at that point! Both of these patterns are good ones. The first one is more difficult in that you have to be really careful when you pick up the stitches for the edging or you will have a side that is longer than the other. I’d like to knit this second sweater again sometime, although it’s like reading a book for the second time – there is no time to do this because there are so many great patterns to knit and books to read! This entry was posted in Knitting and tagged Granny's Favourite, Little Ancolie, Regrowth, regrowth shawl by cpeezers. Bookmark the permalink. Both sweaters are so sweet. You’ve created an heirloom for the little ones who will wear them. Christina – be sure to let me know if you order more yarn so I can send you money for it!! I love your Granny Favorite sweater. Where can I find its pattern?